Chuck Croft is chief executive officer for DRG, a position he assumed in July 2017. DRG is the parent company of Annie's and SFG, media and technology solutions companies owned by the Muselman family of Berne, Ind. Prior to this role, Croft was vice president of finance and administration for the Milwaukee Rescue Mission, a Christian-based non-profit that serves the homeless, hungry and poor in Milwaukee, Wisconsin. He served as president of Kalmbach Publishing Co. from 2012 through 2016 and was on its board of directors. Kalmbach is a special-interest and enthusiast media company with a family of magazine brands and related books, and produces websites and events based on those content areas. He joined Kalmbach in 1998, and served the company as executive vice president, senior vice president and chief financial officer. 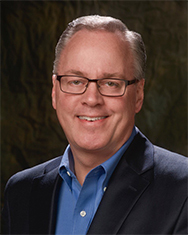 Prior to Kalmbach, Croft held executive positions in financial services and manufacturing companies. Croft served on the MPA-The Association of Magazine Media's IMAG advisory board from 2007-2016. Croft and his wife, Julie, have three daughters. He is a graduate of Drake University.